When they think of anchovies, most people, at least here in the US, think of salt-cured anchovy fillets packed in oil. 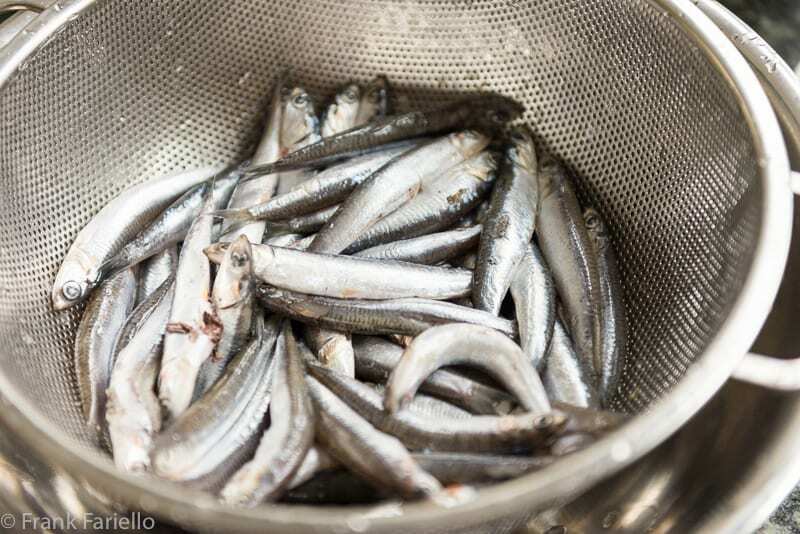 If you’re a bit more au fait with Italian cookery, you may even know about anchovies sotto sale, or packed in salt. You may also know cured anchovies are a fantastic way to add some intense umami to your cooking, whether or not you’re cooking seafood. 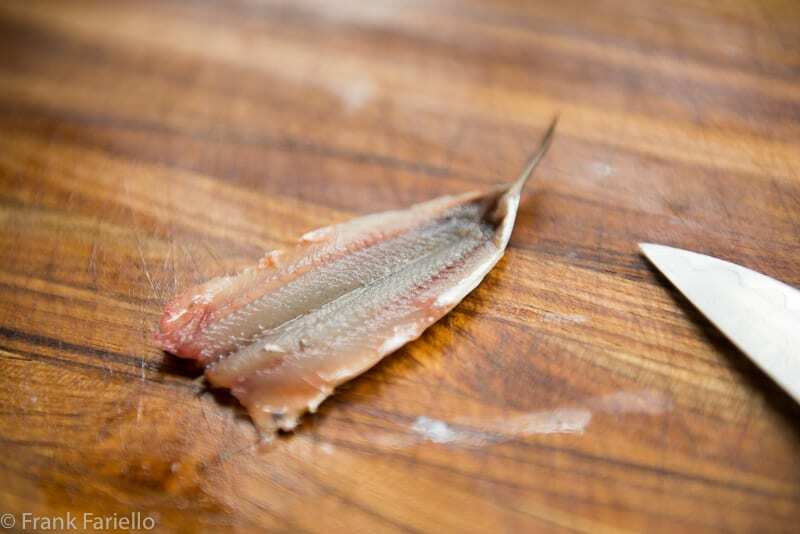 But did you know that fresh anchovies are a thing in Italian cooking, and that they make for some excellent eating? They can be hard to find (see Notes below), but fresh anchovies are well worth seeking out. 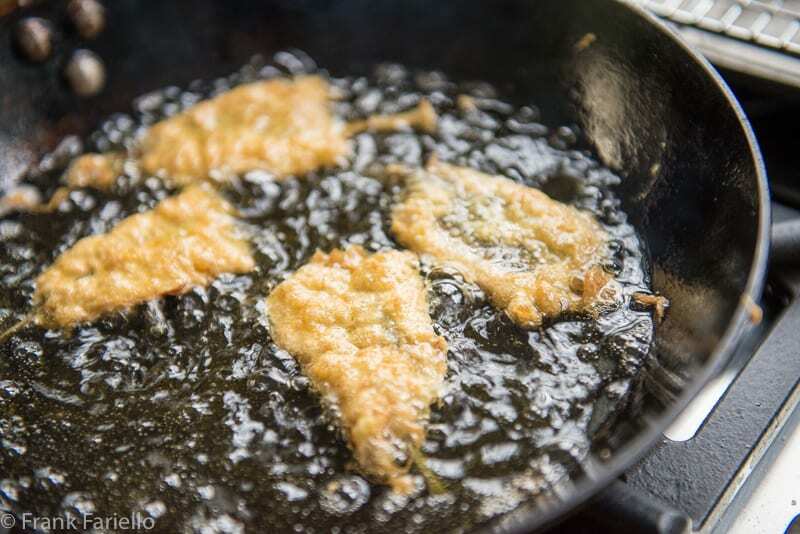 In this Neapolitan recipe, fresh anchovies are cleaned and simply battered by dipping them in flour and then in egg, and then quickly fried in olive oil until golden brown on each side. It’s a method very much like the one for making Angelina’s fried vegetables, but being a fish dish, without the grated cheese often added to the egg. The only slightly tricky part of this simple dish is cleaning the anchovies, so we’ve given you step-by-step illustrations to show you the way. It can be a bit awkward at first, as whole anchovies are small and slippery, but with a little practice, you’ll be churning them out in no time. If you’re fresh anchovies are frozen, let them thaw out completely. This can be done fairly quickly by immersing them in tepid water. Drain them entirely. You can rinse the fillet off so it’s perfectly clean if you like, then pat them dry. Keep going until you’ve cleaned all your fillets. Lay out the flour and seasoned egg in separate bowls and pour enough oil in a skillet to come up about 2cm (3/4 inch) or so up the sides. Heat the oil until it’s quite hot but not yet smoking. Once golden brown, remove the anchovies to a platter lined with paper towels or, even better, a baking rack, to dry off a bit. Just as soon as you’ve fried all your anchovies, arrange them on a serving platter, season them generously with salt, and serve them right away with lemon wedges or slices on the side. Ideally, you should eat these fried fresh anchovies while they’re still nice and hot. As the Neapolitans say frijenno magnanno—”fry and eat!” But if you really must make these ahead, they can be re-heated in in a moderate oven (180C/350F) for 15 minutes or so. Don’t salt them, however, until just before you’re ready to eat, or they’ll get soggy. Very small anchovies can be fried whole, which obviously makes the whole dish much easier. In this case, the anchovies are more typically dredged in flour only seasoned with salt before frying, in the manner of a fritto misto di mare. And, indeed, fried whole anchovies can very easily be part of a fritto misto. Besides frying, fresh anchovies can be made a number of different ways. To my mind, they are particularly lovely lightly poached and dressed with the same lemon and parsley sauce you would use on baccalà. Let the whole anchovies simmer gently for about 2-3 minutes, then drain well. Let them cool off a bit and, as soon as they are cool enough to hand, filleted them with your hands. Be careful, since once boiled fresh anchovies are liable to break apart quite easily. If you're fresh anchovies are frozen, let them thaw out completely. This can be done fairly quickly by immersing them in tepid water. Drain them entirely. Now take an anchovy and slit it horizontally down the belly. 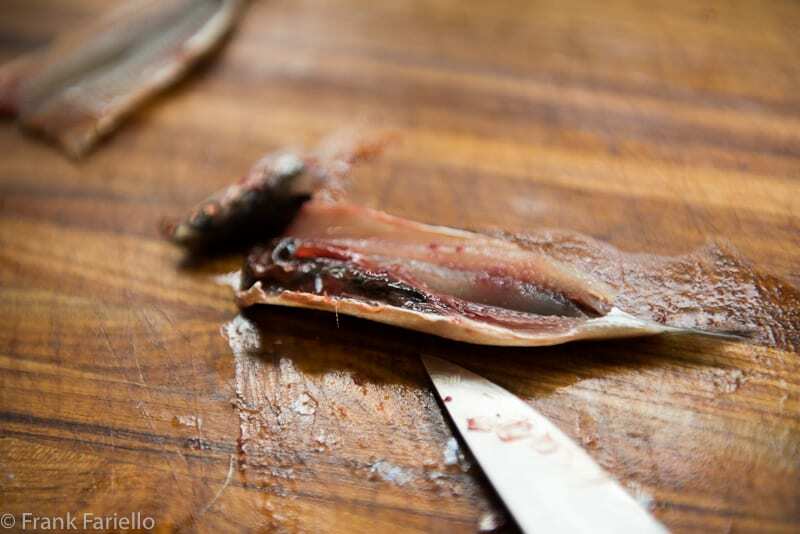 Cut off the head, then with your fingers, gently open the two sides of the fish up to expose little 'vein' (actually the viscera) and backbone. Scrape out the vein, then with the help of your paring knife, very gingerly detach the backbone from the fish, slipping the knife under the bone to detach it, then using it to hold down the fillets while you lift the bone away from the fillets with your fingers, taking care to avoid separating the two fillets from each other. (If they do separate, it's no real problem, but it will be a bit less pretty.) Stop when you get to the tail. Cut the backbone off just below the tail, keeping the tail attached to the two fillets. You can rinse the fillet off so it's perfectly clean if you like. Keep going until you've cleaned all your fillets. Lay out the flour and seasoned egg in separate bowls and pour enough oil in a skillet to come up about 2cm (3/4 inch) up the sides. Heat the oil until it's quite hot but not yet smoking. Now, using the tail as a 'handle', dredge each anchovy in the flour, then in the egg, then place it gently in the hot oil. Repeat with more fillets until the skillet is full, but not crowded, with fresh anchovies. Fry on both sides until nice and golden brown, adjusting the flame if you need to to maintain the oil at a hot but not smoking hot temperature. The oil should bubble vigorously around the edges of the fresh anchovies. Just as soon as you've fried all your anchovies, arrange them on a serving platter, season generously with salt, and serve them right away with lemon wedges on the side. I love anchovies prepared this way, Frank. I was first served fried anchovies in a restaurant in Florence 2 years ago. 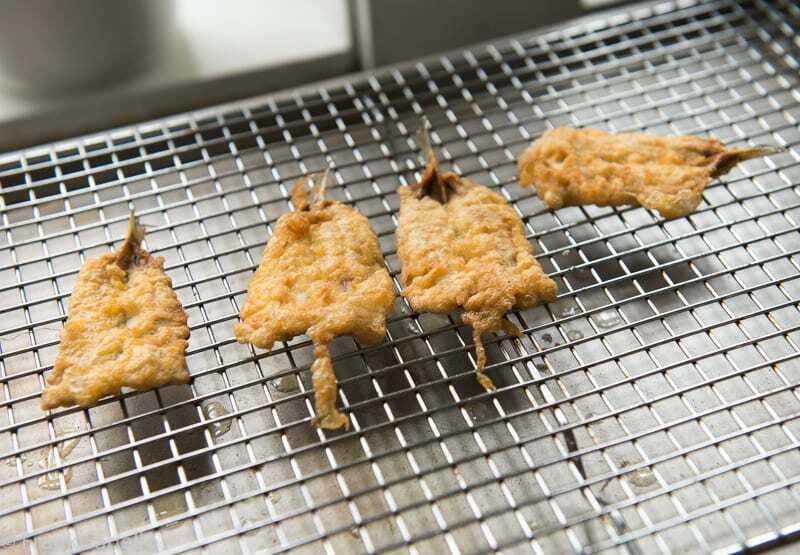 Each was put between 2 large sage leaves before being batter-dipped and fried. They were heavenly! I’ve since made them here but, unable to find fresh/frozen anchovies, I found a large can of them packed in salt. Not as good as fresh but certainly better than those packed in olive oil. I’m still on the look-out for fresh, though. I’ll find them and will next check a Spanish store. Thanks foe sharing your recipe and for the tip about finding them. qui a Trieste le acciughe le chiamiamo sardoni, hanno una pezzatura più grande e un sapore più gustoso di quelle del resto d’Italia, siamo abituati a pulirle ed eviscerarle solo con le mani, è un’abitudine che abbiamo da sempre e ti assicuro che aprirle “a libro” riesce molto più velocemente… Buona Pasqua Frank, un abbraccio ! Solo con le mani? Ammazza… ! If you live on the water sometimes a fish store at the docks will have them for sale as bait. Oh how I’m longing for fresh anchovies after seeing this post. My fish market does get fresh sardines, but I have never seen the anchovies there. You’ve given me impetus to ask. But I’ll look for those frozen ones from Spain too. 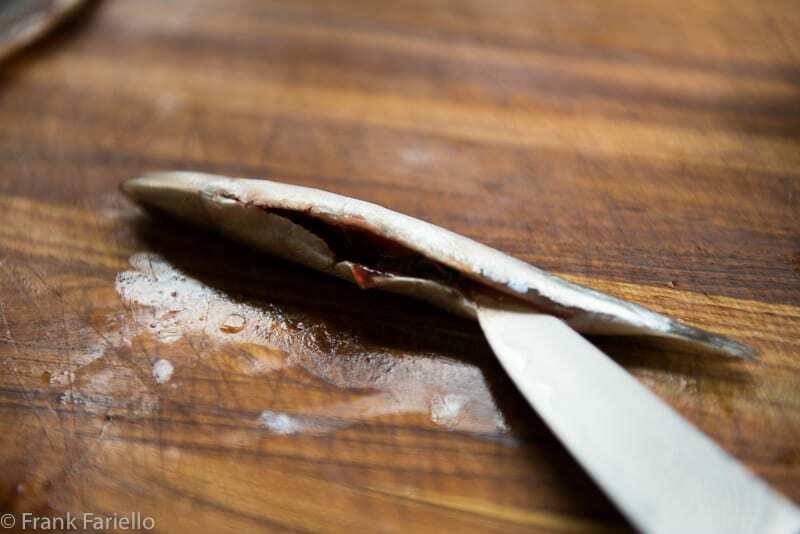 I so enjoyed anchovies in some form or other many times while I was in Liguria last year. 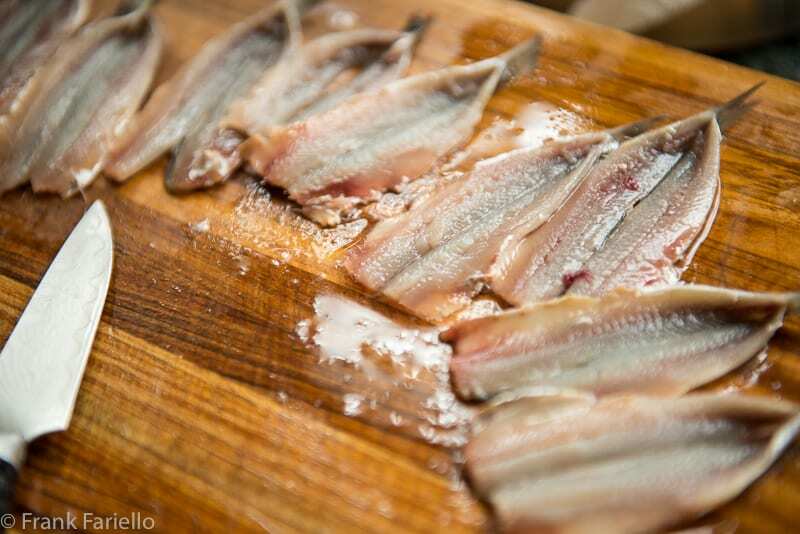 Of course, you could prepare fresh sardines in just the same way, even smelts. Funny why fresh anchovies so hard to find on these shores, they’re so delicious, aren’t they? Frank these are a favorite of mine and fortunately there are sometimes available in the Bay Area. 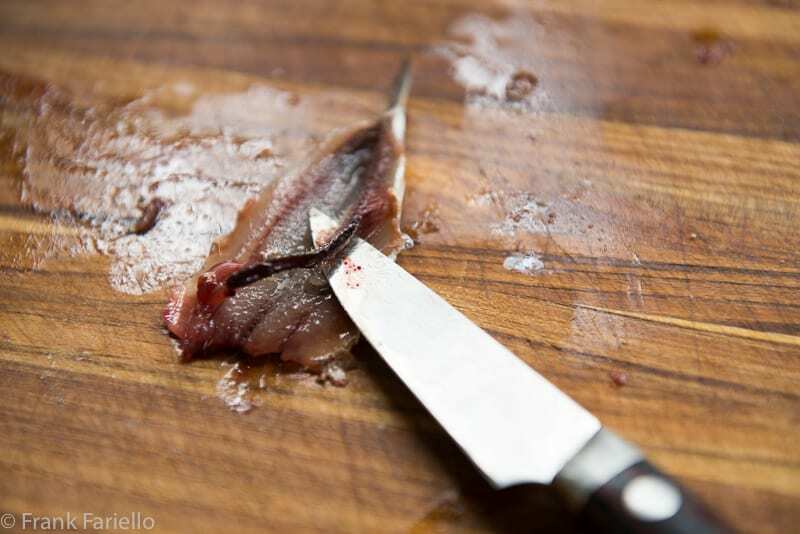 Your step by step photos with respect to preparing the sardines simplify the process. I have had these in Italy and they were delicious. The only thing we can find in Minnesota are the tinned anchovies and they don’t work for me. All I taste is salt. I’ve never looked for frozen – will check out at the Italian delis in St. Paul. You never know. Worth a try, Claudia! Let us know if you’re successful. 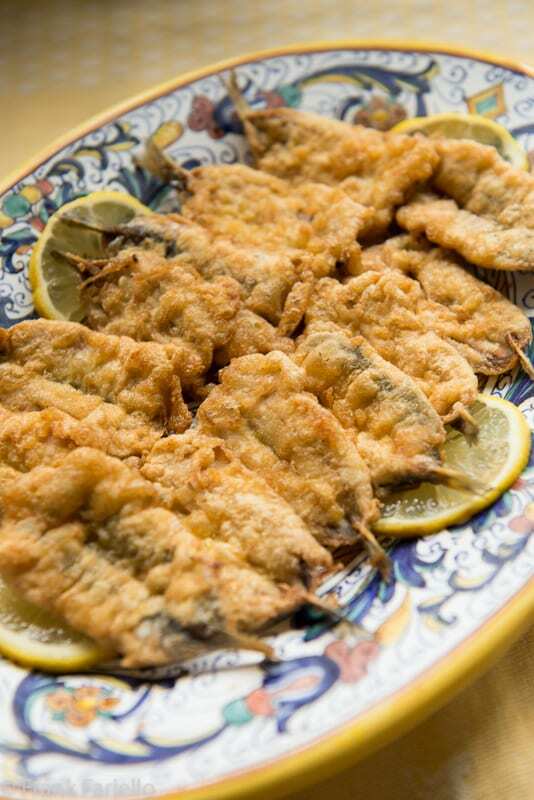 We LOVE fresh sardines here in Greece as well, but never had some batter-fried for some strange reason:) Those look fantastic, we’ll pair them with a horiatiki salad and we bet the combo will be divine! Excellent instructions (and recipe) Frank! my father, from calabria, used to make also a tortino di alici: layered butterflied anchovies, breadcrumbs, oil, garlic, parsley then baked… delicious.. actually it is one of the dishes we used to make when we had a restaurant in Dorset. yes, u r right: here in the uk anchovies and sardines can be found, but the supply is rather erratic, especially anchovies. sardines are easier to find because in their adult stage are a local fish, called pilchard. For once though, I sort of disagree with you Frank: I think actually that sometimes cheese and fish do go well together and pesce azzurro is a case in point… I think that adding a little grated pecorino/parmesan the the crumbs works really well – just a matter of personal taste of course. what is not clear to me is their season: I keep on reading different things.. as far as I knew alici and sardines are a winter thing…. but now I am not sure. anybody knows? All those versions sound delicious, Stefano. As far as they seasons go, no idea… I’m just happy to find them when I can! But it’d be nice to hear if anyone knows.